I've written a lot here about my faith, but I've never written about the road that brought me to this place. I wanted to let Meri tell her story first, not only because it happened that way (chronologically) but also because her prayers and our conversations are part of my story. I grew up going to church. Especially during my teen years, I was involved in everything from singing in the choir to assembling the monthly newsletters. Church was a place to see my friends, but a personal faith--a relationship with Jesus--never even occurred to me. When I was about 18, I drifted away from the church. For the next ten or twelve years, my life was turbulent. If I had to describe it with a song title, it would have to be "Lookin' for Love (in All the Wrong Places)." As if that didn't bring enough drama, I also had a prolonged battle with Lyme disease. And, in retrospect, I've realized that I was already starting to have signs of depression. I was 30-ish when I met the man who would become my husband. It was love at first sight, and within a year we were married and expecting a baby. I was ecstatic, happier than I'd ever been. Around the same time, Meri came to know Jesus. I was happy for her, but at the same time, I was concerned. I'd never heard anyone talk about having a faith that permeates every aspect of life. The concept was foreign to me, and I worried that she had joined a cult. She assured me that that was not the case, and she kept writing to me about her newfound life. She also started praying that I would find hope in Jesus, as well. A few years later, when my son was two or three years old, my husband and I started to look at options for school. Through an online family forum, I "met" a mom who encouraged me to consider homeschooling. She introduced me to a Christian homeschooling forum, where I not only soaked up the homeschooling information, but also read along with other conversations. I didn't understand it all, but I wanted to know more. I spent every afternoon--while my son was napping--reading and participating in that Christian forum. I can't pinpoint a day when the change in me occurred. It was gradual--more like a sunrise than like a flip of a light switch. Over a period of months, the pieces just fell into place. I understood that I needed a savior and that God wanted a relationship with me. It just made sense. Since then, I have not simply allowed, but invited, God to permeate my entire life. It's not all smooth sailing. I still struggle with depression, with finishing my things-to-do list, and so on. What's different? I have hope in Christ. The worst that this world can do to me is to send me home to heaven. I have the promises of God. He hears my prayers. He forgives my sins. He will never leave me nor forsake me. His unfailing love surrounds me! I have become part of a church family. I am thankful to have had an upbringing that exposed me to church, and also thankful that God has brought my family to a wonderful church. Being part of a community of grace--experiencing love and acceptance from my sisters and brothers in Christ--is a precious gift from God. For a follow-up, see my post about how I'd like to be remembered. That's great Melissa. I love your bulleted list too! I was on another blog and they were criticizing church, saying it was man-made and that people who attend church are worshiping idols. I was appalled. If it wasn't for my church, I wonder where I'd be. Really...they have encouraged me so much to keep going, to walk out my faith, to trust God, and serve Him wholeheartedly. That isn't man-made. That is God using my church to bring me closer to Himself. I think that rocks that your church has helped you do that too. Thanks for sharing your story of God's grace in your life. Melissa, I've been waiting for this post that you promised us. 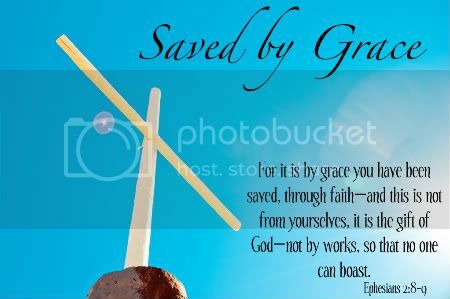 :-) What a beautiful story of God's grace following you and catching you. The deeper I get into my walk with God, the more I understand the importance of HOPE and PROMISES and CHURCH FAMILY, three beautiful gifts of grace straight from the heart of the Father. Isn't that interesting Melissa! You were attracted to Christian homeschooling, and then met Christ afterward. The seeds sown in the church life of your youth came to fruition. I hear great joy in your voice as you tell you story. Amen! Thanks for joining us for Marriage Monday. Love your perhaps unconventional road because the unique order of things. I think there are many seekers out there who find God in this gradual way because the Spirit is insistently calling them. Thanks for share and as far as the hypocrite thing goes, we could all be accused of that and you are right on because even Jesus said the doctor helps those who need it, the sick, not the well. Beautiful post! This is my 16th year of homeschooling and I am amazed how many people have asked the Lord into their hearts AFTER they have started homeschooling. I know most people think of homeschooling as a Christian movement...they don't realize that it is also a ministry. I love your testimony. It is amazing how each of our paths are different, but we all end up a the foot of the cross. Thanks for sharing. Love this line: It was gradual--more like a sunrise than like a flip of a light switch. I think this is beautiful. I also think some of God's "quilts" as I like to call us late bloomers are some of the most powerful, lovely stories of grace and love God has in His diary. He shows Himself strong through our weakness. Thanks for this awesome story! Blessed that your light shines so brightly for Him and spills onto us each day! #LiveSticky! How wonderful how God will really make ways to reach out to us in any way! I'm glad you responded to His calling :D Only God knows your heart. God bless you and enjoy your day! Thanks for sharing, I figured we are all sinners being lead to the path of righteousness. I had to check the spelling on that. God will use anything to draw us to him. In fact, last night a dear Christian friend said to me "Don't you just love how creative God when He is trying to draw us to Him?" That is what it is all about expecting him in your life and getting forgiveness for your sins. Never a hypercrate only human! What a beautiful story, it really is so powerful. Mine was a little of the same I think I started out a little on selfish reasons. Cole was going to school that was attached to a school, if you became a member you would get a discount. I thought what could it hurt going. But the first day I walked in I had a wave of emotion roll over me I was in tears the whole sermon and I knew it was just right for me. It was the hardest thing I ever did on my own. "more like a sunrise than a flip of a switch." Oh, I love that! I was brought up in church, drifted, and came back, but I always have a hard time giving a salvation testimony because I just don't feel like I've had that lightning moment so many people talk about. I've hit my knees and prayed that prayer over and over again and been washed clean each time. I'm thankful that I have full assurance of my salvation, but I can't necessarily point out the exact moment it happened. Thanks for sharing! I love how you said it was a gradual process, I think that needs to be said more often. We read a lot of the Saul type conversions that some people question if they have anything less dramatic. You have a wonderful story and I'm so glad you told it! Thank you for leaving the kind comment regarding mine. Blessings for a great weekend! Thanks for sharing. You are right. Jesus came for those who have a Past." I am grateful for that soooooo much every day. I enjoyed reading your testimony! Neat how God uses various means to bring people to Himself. i love your bullets in the post!!! !